Each year, Realty Executives International recognizes the leading Executives across our network through our annual awards program. As we celebrate 50 years of real estate excellence in 2015, we’re highlighting the achievements of some of our most successful agents, (we call them Executives) sharing important keys to their incredible productivity in real estate, and honoring the many ways they make a difference in the lives of their clients. 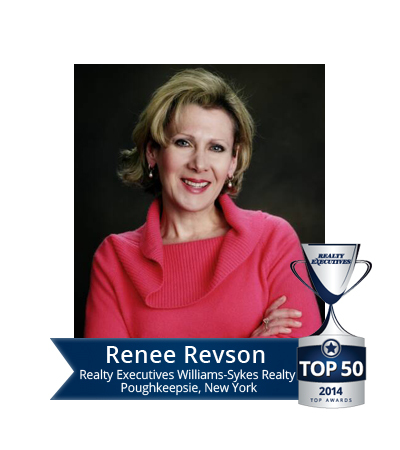 Licensed Associate Real Estate Broker Renee Revson of Realty Executives Williams-Sykes Realty in Poughkeepsie, New York has a host of specialties to her credit, having worked extensively with both buyers and sellers for over sixteen years (nine with Realty Executives). With a keen understanding of the ebb and flow of the real estate cycle and market, Renee shares with us how the Realty Executives business model coupled with full-time brokerage support and shifting market conditions helped shape another meteoric year in her real estate career. Accredited Buyer Representative including First Time Home Buyers, Luxury Move Up Buyers, Downsizers, and New Construction. Sellers Agency including expert negotiator, premier marketing, technology expert. Which factors most attributed to your success in 2014? Did you have an “aha” moment in life – an experience that made it clear to you that real estate was the right career path for you? I knew real estate was my calling when the vast majority of my clients told me they had purchased or sold homes before, but never had the service or results that they experienced with me. When one person tells you that, you just don’t know their previous experience. When everyone tells you that, you know you picked the right career path. What led you to join Realty Executives? After six successful years in the business, the next logical step was to start my own business. Through online research, I learned about the Realty Executives business model, and quickly realized that instead of opening a brand new unknown business name, I would go with Realty Executives, employ their branding, and reap the benefits without having to start a business from the ground up. And I was exactly correct. The best career move I ever made was in June of 2006, when I called Matt Williams of Realty Executives Williams-Sykes Realty. The results I experienced in my first year exceeded my expectations, and I have grown my business significantly every year since. How has your brokerage supported your success in 2014? Real estate is one of those businesses that you can’t just do from 9-5, Monday through Friday. If your support is limited to that, you are not doing all you can do to close deals. My broker is literally available 24/7. We find solutions outside of office hours and by morning we are executing them. What keeps you coming back to your work in real estate, day after day and year after year? My greatest joy as a REALTOR® is seeing clients fulfill their dreams. They have trusted you in helping them either find the perfect home for them, or to sell their home and move on to their next stage in life. The joy they show makes me proud to know that I was a critical link in their life. How would you describe current market conditions in your area? What are some of the most important trends? Interest rates remain low, prices are stabilizing, and demand remains strong at certain price points. How are you guiding clients through the challenges in your area? Clients understand that interest rates will not remain low forever. At some point, maybe later this year, maybe next year, but at some point, interest rates will return to higher historical levels. Even though I have many listings and many clients, I always return phone calls. Promptly. Good thing there is blue tooth technology. I am often on two calls at a time. I make use of every minute of the day. What do you think keeps your repeat and referral customers coming back? Beyond a doubt it is the service I provide. A realtor needs to be knowledgeable and available. My clients get emails from me 2:00 in the morning if necessary. My clients know I am there for them. What are your top lead generation sources? Is a life/work balance something you have achieved in your career? How do you manage the demands of working in real estate? The life/work balance is a difficult task. I have great colleagues, and the few times I am unavailable due to family matters my colleagues step in to help. What is the best compliment you’ve ever received from a client? To contact Renee Revson, call 914-475-3064, email reneerevson@realtyexecutives.com or visit www.ReneeRevson.com.